From the Metro Start screen, tap or click the Calendar tile to start it. If this is the first time you’ve looked at the Calendar app, it may look like the one shown here with duplicate appointments. Swipe from the right or hover your mouse in the upper-right corner, choose the Settings charm, and then tap or click Options. The color-coded Options pane appears. 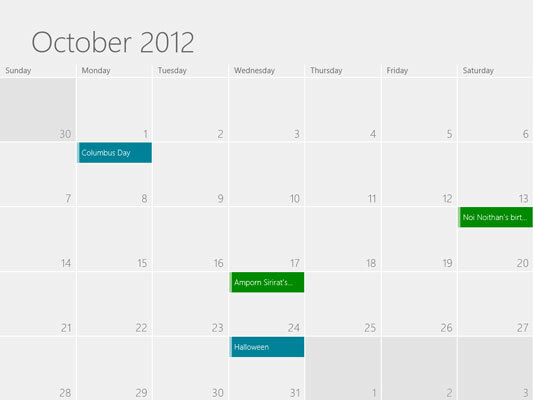 See whether two or more of your calendars have a source that overlaps. If so, turn off one of the interfering calendars. For example, if you have two Hotmail/Outlook.com accounts, both of which have the U.S. Holidays calendar turned on, the holidays are double entries on the main calendar. By simply turning off one of the U.S. 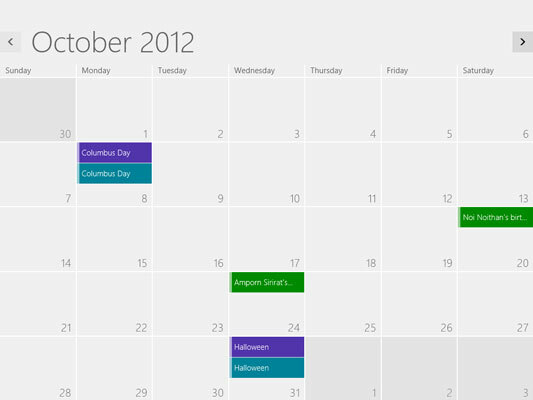 Holidays calendars, the main calendar goes back to looking somewhat normal. Go through the calendars, one by one, and set the color coding for each calendar component to something your eyes can tolerate. When you’re done, simply tap or click outside the Options pane.